It’s easy to assume that “being the change” starts with the faculty, staff, and administration. Honors student Maria Camila Restrepo Chavez (’17) reminds us that JMU’s unique learning environment is actually grounded in the traditions, great minds, and honorable actions of students. Maria Camila was born in Colombia’s “Ciudad Bonita” (Most “Beautiful City”), Bucaramanga. She learned to work hard by watching her divorced mother work hard to support the family, and listening to her maternal grandmother and the nuns at her day school. When her mother returned to Colombia she found no work. She resumed working in the U.S., eventually bringing Maria Camila, her sister, and her grandmother, after she had saved up enough money to rent an apartment and buy plane tickets. Her grandmother sought asylum because one of her uncles in the Colombian Special Forces had run afoul of the drug cartels and anti-government guerrilla groups and put the whole family in jeopardy. Differences between her mother and Colombian father and a custody fight punctuated her first years in Virginia. Maria Camila’s family settled in Ashburn, a place her mother thought would be a great place for the children to get an education. Her mother always put education first. Maria Camila was held back at first, as she knew little English, but by the time she was in second grade (thanks in part to two extra summers in school) she’d caught up. Maria Camila says that she “just had that feeling” that she belonged at JMU. It was a beacon for access and opportunity. “I pictured myself as a college student here. Everyone was friendly, smiling, and happy. And it wasn’t too far from home. Harrisonburg is so completely different from Ashburn. We’re outside the Northern Virginia bubble here. We do not have the NOVA attitude. I found out that people exist at JMU that are like me.” Harrisonburg, she says, is a very diverse community, one where she can easily pick up ingredients that her grandmother can cook with on university breaks. Maria Camila is the epitome of the engaged JMU student. She’s completed an Honors Program practicum with the Gus Bus, JMU’s home-grown “reading road show,” helping students from all over the world, including Latin America, learn how to read. 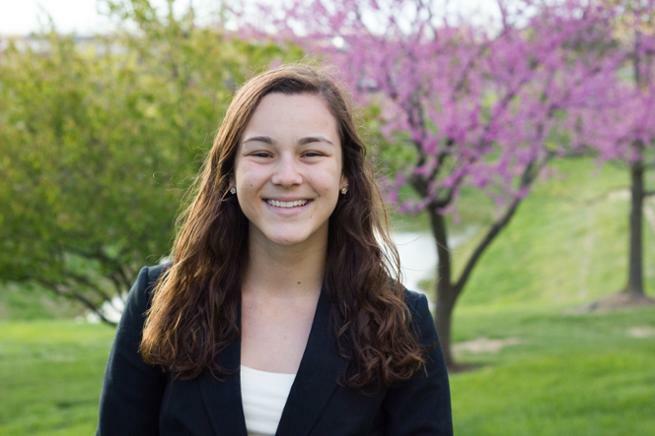 She participates in the service projects of JMU’s Psychology Service Organization. She’s been a teaching assistant in the Honors Program’s freshman experience course. She’s been a First Year Orientation Guide (“FrOG”) and did a JMU Counseling Center internship where she is developing a passion for college personnel student administration. She works in the Center for Assessment & Research Studies (CARS) as a student assistant. Last year she became a key member in a year-long co-curricular record project backed by the JMU IMPACT Leadership Program, an activity usually reserved for JMU faculty, staff, and administrators. Last Summer she studied abroad in Spain on a prestigious Gilman Scholarship and then returned to work for Explo, a summer education program in the Boston area. “Shouldn’t everyone be this engaged?” she asks.